COLOR(S): Sable and white, blue merle, and tri-colored. The name "Shih Tzu" means lion dog in Chinese, it received the name because of its long, flowing mane-like coat. It is a sturdy, lively, toy dog with long flowing double coat. This dog has a distinctively arrogant carriage with head well up and tail curved over the back. It may display an arrogant personality, but is actually playful and gentle. This dog adapts well to any family situation and will enjoy a cuddle in your lap, doing tricks, or fetching a tennis ball. The Shih-Tzu is a happy, hardy, alert, and spunky little dog. It is dignified, courageous and sometimes arrogant. This dog does well with polite, careful children. It is gentle and affectionate. It can get snappish if it is surprised or peeved. It makes friends easily and although obstinate can respond well to consistent patient training. This dog makes a very alert watchdog. It likes to bark, but is usually quiet inside the house. Socialization at an early age is a must. It is generally good with other pets. Some can be difficult to housebreak. It is a naturally active dog but if it is allowed it will lie around in its favorite spots. Daily walks are a good idea. Do not over feed this dog or it will quickly become fat. Long, dense, not curly with a good undercoat. This dog requires a good daily grooming using a bristle brush. A topknot is usually tied with a bow so that the dog can see properly. Some owners prefer to have them trimmed to make the coat easier and less time consuming to care for. 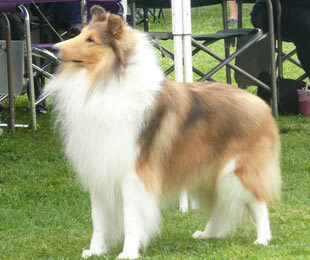 This breed sheds little to no hair and is good for allergy suffers if the coat is kept very well groomed. Kidney disorder, allergies, cleft palate, eye problems, renal disease, and von Willebrand's disease. Minimal exercise is needed, but they will love to play outdoors. An apartment is adequate provided they receive some type of exercise. An owner of a Shih Tzu should be a consistent leader who desires an active, curious breed. They are very adaptable, but the best owner for this breed would be an attentive owner living in an apartment or suburban home. Shih Tzus may be obstinate but patience and consistency will help over come the problem and achieve a reasonable level of training. Puppies need basic training when they are young. They should turn out to be a moderately obedient pet if trained. Learning Rate: High. Obedience - Medium. Problem Solving - Low.